In the roof space of Winchester Fire Station when I became the officer in charge I found a Log book and other material The log is a verbatim record of all the activities of the Andover Fire Brigade (in Hampshire, England) it was started on 2nd January 1908 and the last dated entry was on 11th August 1916 recording all the station activities. I realised I had a unique original 100 year old document. I've scanned over 230+ original diary pages to reproduce them in as much deatail as I can. They represent a full record of everything that this unique original diary contains. Every images In these web pages are replicas of the log page even the pencil entries mostly auditors comments are readable . Other pages contain the name and address of the Captain and of his crew and details of much else besides. It documents all the incidents during that period both large and small as well as recording the outbreak of war in 1914 and it's impact on the station. Many readers will know that almost all towns had fires which were of great distress to the inhabitants and sometimes considerable damage. 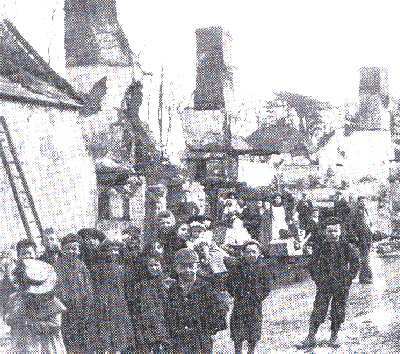 On the right is one I found for Andover on Easter Monday 1901 which left families and about a hundred children homeless. Slowly over the years I typed the log details on to pages in a folder and they lived on my office bookshelf with just occasional readings. Then one day when talking about them to my son he demonstrated to me that my own computer has the ability to display them as they were actually written .I recognised that displayed in that way they demonstrated both the authenticity of the log and the phraseology of the times this fired my enthusiasm to share them with you. If you have information please contact me. I promise to look after them and mention you in the credits. If you know any of the persons featured in these web pages. I would love you to contact me this would bring history to life for both the fire service and Andover residents.